Would you rather relax on the beach or explore an urban jungle? With stopovers, you can do both on your next award trip. You’re all set to redeem your Mileage Plan miles – but wait! Did you know that Alaska Airlines allows you to include a free stopover on many award tickets? They allow you to stop in another city on the way to your final destination, squeezing in two trips for the price of one. You can spend days or even weeks before continuing the trip. Stopovers are often used during international travel. Say you’re flying from Los Angeles to Bali. Alaska Airlines partners with Cathay Pacific, which serves many Asian markets. However, you’ll need to connect in Hong Kong along the way. Let the Alaska reservations agent know when you book your ticket that you’d like to book a stopover in Hong Kong. Now you can try some of the city’s excellent dim sum before you resume traveling. Alaska has a particularly generous policy for booking stopovers on award tickets. You get one stopover for each one-way ticket, which means two stopovers when you fly round-trip! Many other carriers allow no stopovers at all, or only one stopover on round-trip itineraries. Here’s another great way to use stopovers: If you’re planning to visit Europe, you could make Munich your destination, stopover in London on your way there with British Airways, and then stopover in Paris on your way back with Air France. Adding stopovers will not change the number of miles you pay for your ticket, but the taxes and fees could vary. Searching for and booking travel that includes stopovers is a little more complex than your average award ticket. You can’t just search for a flight from Seattle to Munich, for example, because the booking tool will assume you want to minimize the connection. Instead, you will need to search for two different trips: Seattle to London, and then London to Munich. Use the multi-city search option if you’re booking online and enter different dates for each flight; you can leave the return portion blank if you’re not ready to book that yet. You could also call an Alaska Airlines reservations agent (1-800-252-7522 between 5 a.m. and midnight) and ask for assistance booking a stopover. Calling reservations is necessary in the case of Cathay Pacific and LAN, as they cannot be booked online. Whichever path you take, I recommend that you start by performing a separate one-way search to your stopover destination. The long-haul flights to gateway airports, such as Seattle to London, will be more challenging to find award space. Shorter flights tend to be more plentiful. If you can find a flight to London, you’ll probably be able to pick any date you want to continue your journey to Munich. Remember that you can’t combine multiple partners in the same award. If you need to fly British Airways between London and Munich, then you’ll also need to fly them from the U.S. to London. Different partners may provide better options for a stopover in certain cities. Although Delta Air Lines has award space available to London, you can’t choose this flight and also book a stopover on British Airways. Once you know which dates work, go back and add the connection as part of a multi-city search, or speak to an Alaska reservations agent and let them know you think you found some dates with award space. Results from a multi-city search indicate two flights for the same number of miles, but note that there is a two-week stopover between each leg. With any luck, you’ll soon be visiting two or three destinations for the price of one. You worked hard for your miles. Make sure they work hard for you. Award travel space is limited and subject to certain restrictions including blackout dates and other capacity controls. Alaska Airlines cannot ensure availability of award seats on any flight, route, or date. 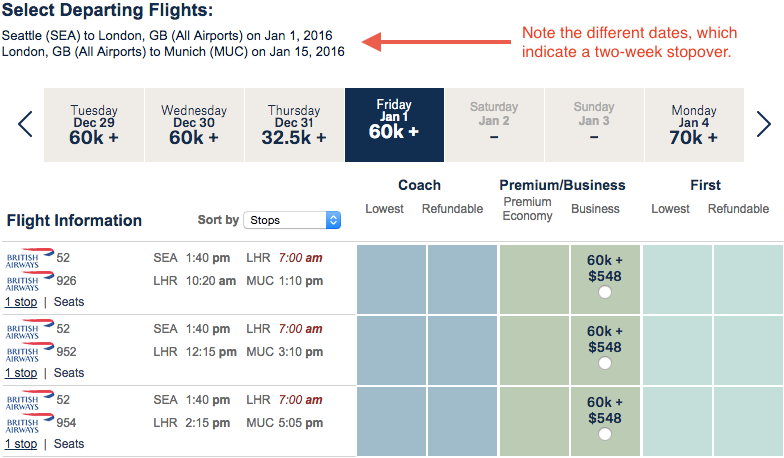 4 comments on "How to book a stopover on your next award"
What is happening with AeroMexico? I wanted to book an award trip with them from Bellingham to Santiago, Chile, and back from Buenos Aires like I did last March, and they do not show up at all. Laura – Due to technical difficulty, new award bookings or changes to existing award bookings for travel on Aeromexico are unavailable until further notice. We’re so sorry for the inconvenience. You use to allow stopovers on the domestic regular coach RT tickets for I believe 25k miles. Why not now? I once had 7 legs on a RT first class FREE ticket between San Diego and Dutch Harbor. My stopover was Sitka. I also had “forced” stopovers in Juneau and Anchorage. Had plenty of people arguing that I couldn’t do it but I guess I knew the rules better than almost every airport agent.